What Happens at the OKTOBERFEST stays at the OKTOBERFEST…SO PROST ON!! The hard working Germans are suddenly tired. Why you ask? Well, the Oktoberfest is just over and they are still recuperating!! The sudden loss of Mass (German one litre beer mug) from their hands is still a sore spot and their feet are still itching to walk back to the Wiesen (Oktoberfest grounds). But well, they always have the next year to look forward to and maybe put a spring back to their cold (only because of autumn is settling in fast) feet! After my second visit to the world’s biggest Volksfest (people’s festival), I thought I should pen down not only my experience but also a few tips for those keen to visit the festival next or coming year/s. Before I start, in case any of you are planning to visit the fest in 2018, stop reading (and whatever else you are doing) and book yourself in one of the beer tents NOW! And I am by no means exaggerating – booking for the tents begins within a few days of the end of the festival and are sold out before you can say Prost! Let me begin with a brief history of the festival for the more curious. Oktoberfest was initiated in its original form in the early 19th Century, in Munich, mainly as celebration of the (then) Crown Prince Ludwig I nuptials with Princess Therese of Saxony-Hildburghausen. The first festivities were held in the Munich field grounds near the city gate, which is now named “Theresienwiese” (Theresa's fields). Even today the Oktoberfest continues to be held on the same grounds. What began as horse races, have now culminated in the largest beer festival of the world! In case you are not sure what magnitude I am talking about, here are a few statistics from the 2017 festival (and this is just Munich!) – 6.2 million Guests converged at the Wies’n and consumed close to 7.5 million litres of beer in just a fortnight!! So if you are a beer lover – this is your Mecca!! Ironically, I am more of a wine person, but that hardly mattered; I had to experience what the fuss was about. And was I in for the shock of my life! This was not just another “fair” or “festival”, it was like Disneyland for the Germans, who are always up for a glass of beer! The grounds itself is about 42 hectares (0.42 square kms) and is one of the biggest fairgrounds in Europe. During the Oktoberfest there are about 14 bigger official beer tents, 22 smaller tents serving beer, other drinks and German speciality fair food and several carousel and other amusement rides to keep the visitors occupied throughout the day and well into the night. The festival begins with a parade from all the breweries in horse drawn carriages and floats. This is then followed by the traditional Beer Barrel Tapping - at noon the city mayor opens the first beer barrel in the Schottenhammel (beer brewery of Bavaria) tent. With the initial pass and the exclamation "O'zapft is!" ("It's tapped!") The Oktoberfest is then declared as opened. Twelve gunshots are then fired on the stairway of the city’s hall of fame -Ruhmeshalle. This is the signal for the other restaurateurs to start with the serving of beer. Now on to the more fun facts. 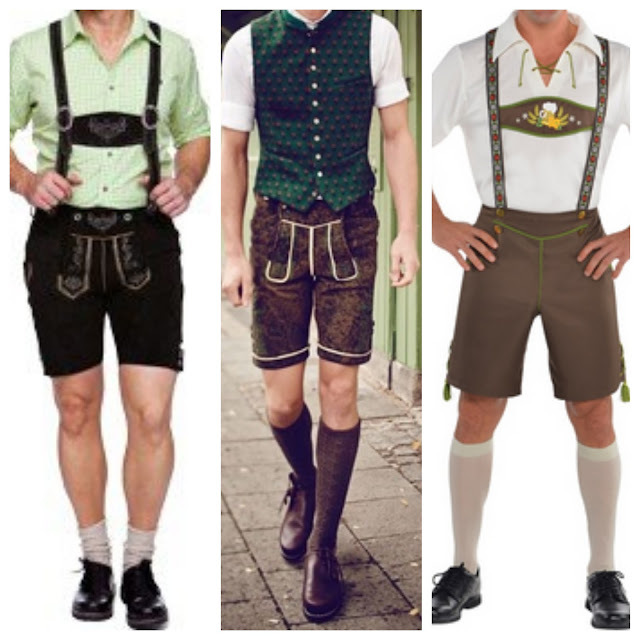 In case you really want to get into the mood of the fest, you need to be dressed in the traditional attire. 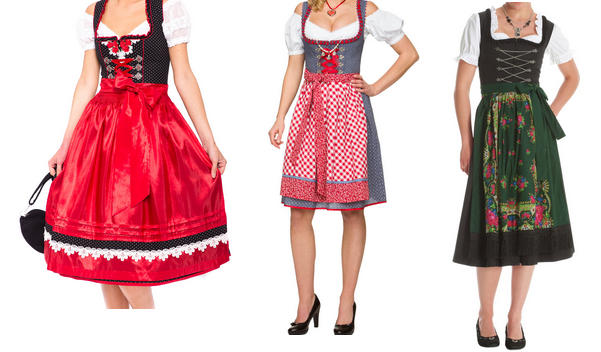 For women, it is a Bavarian Dirndl dress with an apron tied around it. Each apron is wrapped and typically tied with bow on the front. Put your bow on the left side if you’re single, the right side if you’re taken, and in the middle if you’re are a virgin! Also, just based on my past visits, I would suggest braiding your hair – preferably two braids, if your hair (and you) are upto it! That would really make you blend in the crowd. Now that you are dressed to the nines, let us start with the beers and food. Inside the grounds you will find 2 options for beer – either inside one of the big tents or at stalls all across the grounds. To get inside the tents, you need to have reservations, which can be done online, or else you can hang outside the tents for an hour or two and hope someone leaves and you can then get inside. These tents are essentially huge wooden marquees of the 14 official breweries of Munich, and have been brewing beers for centuries. Once inside, you are easily sucked into the music, dancing and gala. People dancing on the wooden benches, waitresses mulling about delivering the beer, traditional German music being played by local live bands and the outside world just ceases to exist! Beer at the fest is generally only available as “Mass”, which is essentially a one litre beer mug. The locals consume an average of 10-12 Mass of beer on any day of the Oktoberfest! So it’s no joke when I say that the fest is not for the weak-hearted! Although you will be spoilt for beer choices, my personal favourites were Paulaner and Löwenbräu. The former is more of a strong lager and the latter is a slightly malty flavoured “meadow” beer. Food options are also ample, but mostly limited to Bavarian and German favourites – like wurst, sauerkraut, schnitzel, fish delicacies, pommes (potato fries), crepes, and roasted nuts. You will also find a few coffee, soft drinks and such other stalls, but I say why bother??!! So now that you are reasonably equipped with the information about Oktoberfest, when are you making your flight? I really hope to make it to Oktoberfest some day. While I'm not a beer drinker at all, I just think it would be a lively experience! Sounds like it was really fun!